What can closing odds tell us about profit expectation? by Sportstatist • 28.08.2018 • Comments Off on What can closing odds tell us about profit expectation? Calculating how much you can expect to win (on average) for each bet you place is a crucial part of betting. Although you only know the closing odds of an event after it starts, they can still be used to measure profit expectation of a bet. Want to know how? Read on to find out. Expected value is “the amount a player can expect to win or lose if they were to place a bet on the same odds many times over, calculated through a simple equation multiplying your probability of winning with the amount you could win per bet, and subtracting the probability of losing multiplied by the amount lost per bet.” But how do we go about calculating it? 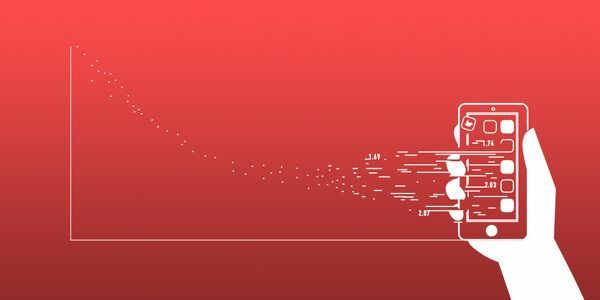 This article seeks to revisit one method I’ve discussed previously – the closing odds – to measure the expected value of a bet and see what they can tell us about our range of expectations. In doing so, we will also be able to expose tipsters whose records are too good to be true. If we place a bet with odds 2.10 that has a true probability of winning of 50%, our equation for expected value is as follows. A simpler way we can calculate this is by dividing the actual odds by the fair odds, where the fair odds are the inverse of the true win probability, in this case 2.00. In the first example, the figure for EV is the percentage profit over turnover (POT) expectation. In the second, it is the percentage return on investment (ROI) expectation. Remember: ROI = POT +1. I prefer the second example, so for the remainder of this article, that is what I shall use. The odds we bet / closing odds ratio provides an accurate measure of the expected value of a bet. In this instance I used the opening/closing odds ratio. After testing this hypothesis over a very large sample of soccer matches (132,645 in total), a very strong correlation was found between the ratio and actual returns one would have realised. For example, for matches where the opening/closing odds ratio was 1.05, actual returns were roughly 105%. Where the ratio was 1.10, the returns were about 110%, and so on. Whilst this aggregated data analysis can’t tell us on a bet-by-bet basis whether we really held the value the ratio suggested we had, averaged over many bets, the metric provides a very useful measure for estimating expected value and expected returns. Odds move because information about a team arrives at the market and influences the way bettors bet on that team, thereby influencing the odds that the bookmaker will publish. Standard thinking is that when more bettors bet on a team, their odds will shorten; fewer and they will lengthen (although arguably bookmakers may sometimes opt to contradict this philosophy if they feel the majority of bettors are behaving irrationally). Some odds move a lot if significant new information about a team arrives at the market, others not very much. Over what sorts of ranges do odds move for a soccer match? Using an even bigger sample than the one above (162,672 matches in total), I calculated the opening to closing odds ratios for all home and away teams, once Pinnacle’s betting margin had been removed from them. These ranged from 0.18 to 4.36 with an average of 1.003 and a standard deviation of 0.12. The standard deviation provides a measure of how a set of data varies. In this sample, three-quarters of the odds ratios lay within ±0.12 of the average, that is to say about 0.88 and 1.12. Hence, while there are a few outliers like 0.18 and 4.36, most of the odds movements between market opening and closing were fairly limited in size, as the distribution below illustrates. Let’s take a closer look at different values of odds. 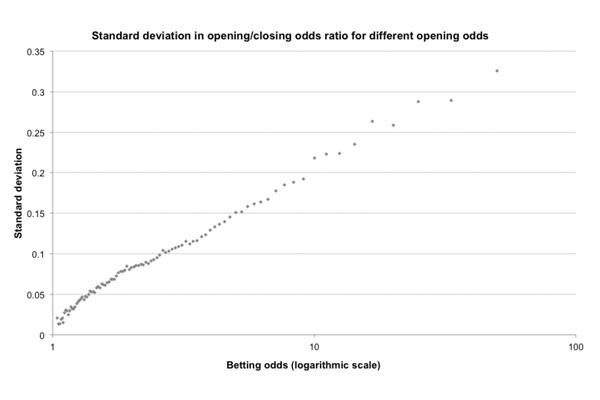 The charts below show that the shorter the betting odds are, the smaller the range (standard deviation) of opening to closing odds ratios is. Remember, the average standard deviation for the whole sample is about 0.12. This is hardly a surprising finding, given that longer odds are accompanied by more uncertainty and more variance. News that affects the betting on a team is likely to have a bigger impact for longer priced teams. 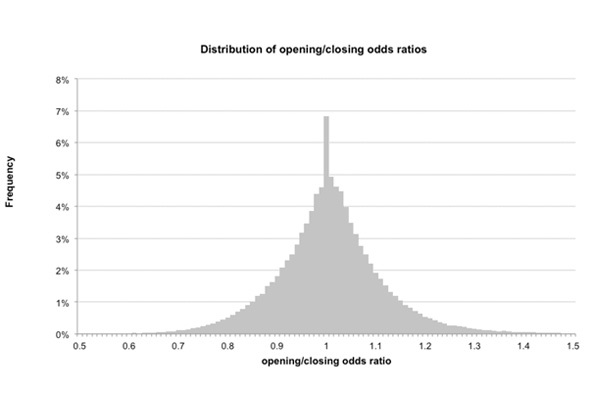 The variability in odds movements between opening and closing is roughly proportional to the logarithm of the betting odds. 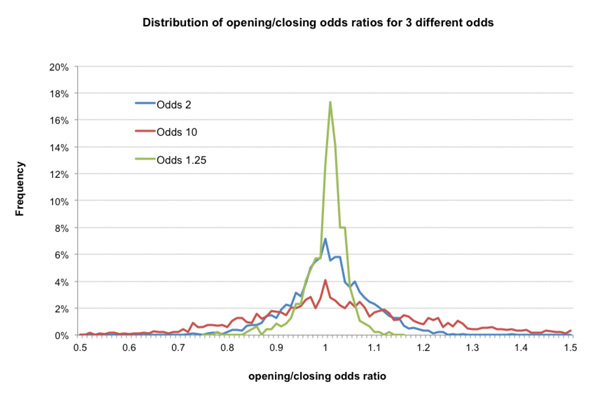 We can perhaps better illustrate ranges of opening to closing odds movements for different odds by the following chart, which compares the distribution of opening/closing odds ratios for three different opening odds (margin removed): 1.25, 2 and 10. For short odds, the distribution of odds movements is much narrower than for long odds. Conversely, for long odds, the distribution is much wider. A third of opening odds of 10 held expected value greater than 110% based on the price they closed at. For odds of 1.25, by contrast, this was less than 1%. Again, this is hardly a revelation. After all, the maximum possible expected value for a price of 1.25 would be 125%. Nevertheless, it’s still helpful to visualise the range over which different odds actually move. From this information we can formulate an idea about what sort of long-term profitability is realistically possible. If relatively few soccer match bets hold significant expected value based on our hypothesis of the opening to closing odds ratio, then this should temper our expectations. The average of all positive expected value bets here was 108.8% with a median of 106.0%, whilst just 2.8% of the whole sample had expected values greater than 125%. Given these observations, we shouldn’t really be expecting to see returns of 130%, 140%, 150% or more over the longer term. Standard thinking is that when more bettors bet on a team, their odds will shorten; fewer and they will lengthen (although arguably bookmakers may sometimes opt to contradict this philosophy). There simply aren’t enough opportunities available where odds move so significantly for our expected returns as high as 130%+. And we certainly couldn’t be expected to find all those which do – after all, we have to bet them before the closing prices are known – and not make some errors along the way; there is simply too much randomness in sports betting for us to be right every time. Yes, we can and might do better over the shorter term, but arguably that would be down to luck, and expected value has nothing to do with that. We might be encouraged by the potential for superior expected value through betting longer odds as the charts above imply. But wait: we are forgetting the bookmaker’s margin. The analysis thus far is based on ‘fair’ odds with the margin removed. With Pinnacle’s soccer match betting odds margin applied (about 2.5% on average), a fair EV of 100% will actually hold negative expectation. Furthermore, because of the favourite–longshot bias prevalent when bookmakers apply their margin (meaning the margin is not applied equally across home, draw and away) the longer the odds, the more negative that expectation relative to ‘fair’ odds will be. 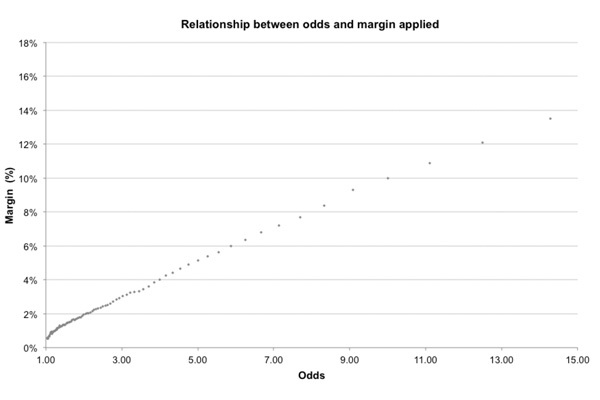 The chart below illustrates an idealised relationship between Pinnacle’s soccer match betting odds and the specific margin applied to those odds within a home-draw-away book. Odds of 10.00, for example, will have roughly a 10% margin applied to them (much larger than the average margin of 2.5%). Consequently, if they subsequently close at 9.00 (an opening/closing ratio of 1.11, the implication is that the original odds held barely any profitable EV at all. Whilst betting longer odds might offer us more opportunities for greater odds movements and expected value, the greater margin weight applied to those odds by the bookmaker will significantly eat into that potential. In an earlier article, I described how the Wald–Wolfowitz runs test for randomness can be used to test the credibility of a tipster’s picks history. We can complement this by using our closing price hypothesis. Since we know that actual returns correlate significantly with the bet price to closing price ratio, we can use this information to test whether a published tipster’s record reveals evidence of such a correlation. For example, where a tipster’s picks history claims a 120% return on investment, is that history made up of picks that show pick odds/closing odds ratios of 1.20? Let’s look at an example. One online tipster (part of a network of tipster services) makes the claim of an 80% success rate (from 1X2, Total goals and Asian Handicap betting), making it one of the highest-ranking tipster websites in the world. Tipsters might argue that closing prices have nothing to do with results. Correct, but our hypothesis implies they have everything to do with expected returns. Taking a look at their picks we can see that the overwhelming majority of their odds are in the range 1.7 to 2.1. Indeed, looking at their last three months of published results, they are reporting a 138.6% return on investment from 839 picks with average and median odds of 1.93 and 1.90 respectively. Using our closing price hypothesis, we can make the argument that such picks should typically be shortening by roughly a factor of 1.40. In other words, a bet advised at a price of 1.90 should, on average, shorten to about 1.35 by kick-off. We already know from our earlier analysis that such significant price shortening as this is incredibly rare. 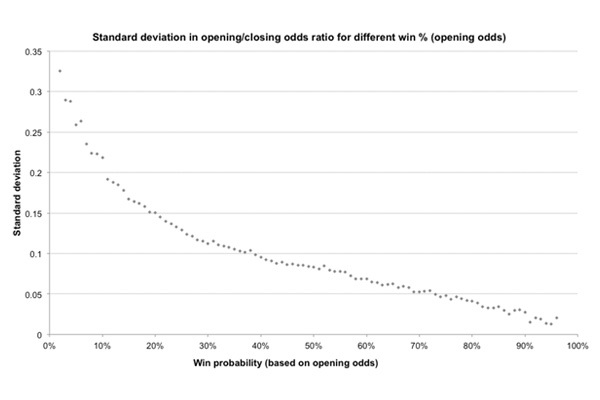 For odds of 1.90, the standard deviation in opening/closing odds is about 0.08, equivalent to closing odds of about 1.76. Odds of 1.35 are a full five standard deviations away from the mean. In my sample there were 50,149 opening Pinnacle odds (stretching back over 10 years) between 1.70 and 2.10; just seven of them shortened by more than a factor of 1.40. Yet we are meant to believe that this tipster has potentially found nearly 7,000 of such high value bets since 2015. That would imply they’ve made their pick choices from a population of 50 million possible bets in a three-year period. Given the limited range of markets they target, this figure is plainly absurd. Let’s look at a few of their recent picks. It’s just a small sample of picks but already the pattern is clear; some picks they advise shorten in price, some lengthen. The average change was by a factor of 1.03 towards shorter closing prices, just enough to cover Pinnacle’s margin at these prices, but not the 1.40 we are looking for. Tipsters like the one analysed above might argue that closing prices have nothing to do with results. Correct, but our hypothesis implies they have everything to do with expected returns. Over the long term, bookmakers set pretty accurate prices, they just don’t make the number of mistakes the results shown above would imply. And if they did, the information the tipster in question would bring to the market by advising the picks they do would leave an obvious trail. If a bettor was this good, they’d get noticed. Either no one is noticing this tipster (and many like them), or this isn’t happening. Which is the more likely? We can use our hypothesis to determine whether our own betting history shows evidence of skill. Where it does, we might reasonably conclude that the bookmakers consider the information we bring to the betting market as relevant. Where it is absent, we might be forced to consider the possibility that we have just been lucky. Bookmakers like Pinnacle use the closing price as a way of identifying sharp bettors. If they are found to be consistently beating the closing price by more than their margin, they will be marked accordingly and used to help create a more efficiently priced betting market, where pricing errors in both quantity and magnitude are kept to a minimum. Consequently, there is a relatively narrow range of expected profitability that we will have to accept. The sorts of performances claimed by tipsters that post results like those shown above are simply impossible. Don’t expect to achieve them yourself; and where you see others claiming them, you now know what they are. ← Does intuition have a place in sports betting?